Theme for Lourdes 2019 is CARIAD. 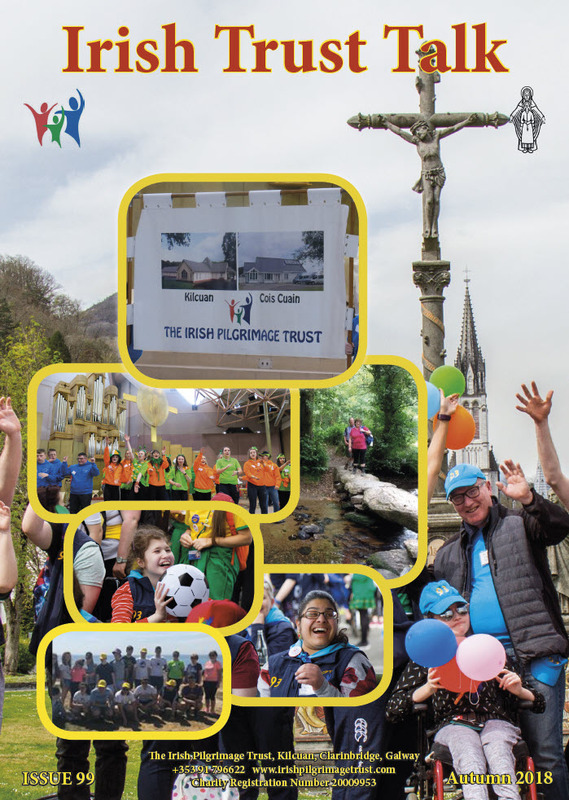 The Irish Pilgrimage Trust is a registered charity in Ireland, and for over 40 years the Trust has been travelling on pilgrimage/holiday to Lourdes with young people with special needs, from all over Ireland. The Trust has over 1200 people travelling at Easter time and it is divided into small groups of approx 10 young people and 12 volunteer carers who stay in one of the many Hotels in Lourdes. During the summer we bring groups to Hosanna House in Bartres near Lourdes for what is a unique experience both Carer and Guest. The Irish Pilgrimage Trust's accounts are audited each year by DHKN, Galway Financial Services Centre, Moneenageisha Rd, Galway. Please click HERE to view our audited accounts. The Irish Pilgrimage Trust coplies with the Code of Governance, please VIEW the Public Statement of Compliance with the Governance Code. The Irish Pilgrimage Trust is listed on the Charities Regulatory Authority register of charities as required under the Charities Act 2009. The registration number is 20009953 and an Annual Activity Report has been submitted to the Regulator. www.charitiesregulatoryauthority.ie. Recent developement in the Community, Voluntary and Charity Sector The Wheel update October 2017. Please click here for The Irish Pilgrimage Trust data protection policy. Our 2020 Cycle will be officially launched at 5.30pm in the Hotel Roissy in Lourdes on Thursday 25th April, during the Children's Easter Pilgrimage. All are welcome. We are delighted with the response to date to the Registration for Cycle 2020. We have 65 committed and many more enquiries. More updates will be published in the coming weeks.